Sept. 16, 2013, 3:15 p.m.
Why be platform agnostic when you can be platform specific? The social news video startup is aiming to match the content to where it’s consumed — and increasingly that’s Instagram. By Caroline O’Donovan @ceodonovan Sept. 16, 2013, 3:15 p.m. If you were being lazy, you might call NowThis News the BuzzFeed of web video. After all, it’s a born-online media company, going after digital natives with a strategy heavy on social and mobile. (And they share some corporate DNA, like Ken Lerer.) In fact, when NowThis News was prepping for launch last fall, it started off by posting its short, ready-to-share videos on BuzzFeed — something it’s done 3,598 times in the year or so since. They aim to publish about 12 clips a day depending on what breaks, says O’Keefe, although usually they hit somewhere around 8 to 10. But he says it’s not because they can’t do more; it’s about knowing the demand of your audience, which is also why they’ll contract well-known photographers to post a photo a day. If O’Keefe is right, it’s a content niche that other news brands on the platform haven’t tapped yet. “You see a lot of repurposed content or behind the scenes photos,” he says. Indeed, a survey of some of the top media companies on Instagram proves he’s right. NBC offers teasers of interviews, MTV has clips of celebrities on the red carpet, and others including Time, Wired, PBS NewsHour and more post mini-promotional videos of the “see more online” variety. A few, including CNN and the Wall Street Journal, use Instagram to issue calls for user engagement; HuffPo uses Instagram video largely to wish celebrities happy birthday. The Washington Post is one of the few that has made a more substantial attempt at putting news on Instagram. The way O’Keefe sees it, there’s a willing audience in people who would never think to turn on a TV to get their news, but refresh their Instagram feed multiple times a day. It’s not that these people aren’t interested in news — it’s that they’re accustomed to the big stories finding them rather than the other way around. NowThis News aims to deliver that news on whatever platform these people will actually receive it. To that end, they’ll soon begin producing longer content for tablet apps to accommodate the “dramatic differences” between how audiences engage on different devices. Think about it: For the same news story, NowThis might now be producing a six-second teaser for Vine; a longer 15-second summary for Instagram; and a longer piece for someone using its iPad app. That’s less platform agnostic than platform specific. Of course, NowThis gets most of the raw material for its content from other sources — stories reported by others that it aggregates, videos posted online, and so on. That helps. But it’s still an impressive commitment to making the content fit the platform. For instance, here’s how NowThis “covered” the news that Voyager I had entered interstellar space a few days ago. If O’Keefe is right, NowThis News is at the forefront of innovation on the next big content delivery platform, but that doesn’t explain how it will make money. 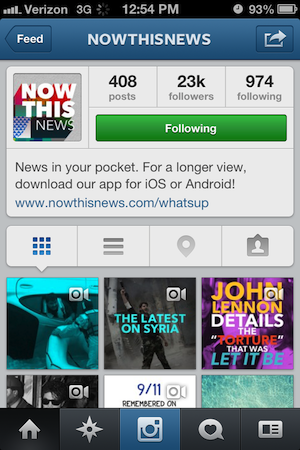 NowThis News hosts no ads, offers its apps for free, and is backed by VCs. One thing they do have is content partnerships, large and small, with companies including BuzzFeed, Mashable, The Atlantic, Hulu, Roku, MSN, and AOL. But the next step according to O’Keefe will be toward what he calls narrative social advertising. The temptation has certainly been over the course of the last year to just turn on pre-roll [advertisements]. Just load up the insatiable demand for video with advertising in front of the content. But…it’s so clear when you begin to think about mobile and social centric content that…nobody wants to pay a toll before they get the content that they wanted. What we set out to do was look for experimental advertisers, brands that were highly interested in learning along with us what the future of advertising is going to be. Of course, building so much of NowThis’ audience on platforms controlled by others — Facebook and Twitter, in the case of Instagram and Vince — means that there’ll always be a risk that its monetization strategy could clash with the platform’s. But O’Keefe believes there’s plenty of counterbalancing strength in going where the users are. POSTED Sept. 16, 2013, 3:15 p.m.
O'Donovan, Caroline. "Instead of shoehorning it in, NowThis News is building video content that fits in where the audience lives." Nieman Journalism Lab. Nieman Foundation for Journalism at Harvard, 16 Sep. 2013. Web. 18 Apr. 2019. O'Donovan, Caroline. "Instead of shoehorning it in, NowThis News is building video content that fits in where the audience lives." Nieman Journalism Lab. Last modified September 16, 2013. Accessed April 18, 2019. https://www.niemanlab.org/2013/09/instead-of-shoehorning-it-in-nowthis-news-is-building-video-content-that-fits-in-where-the-audience-lives/.